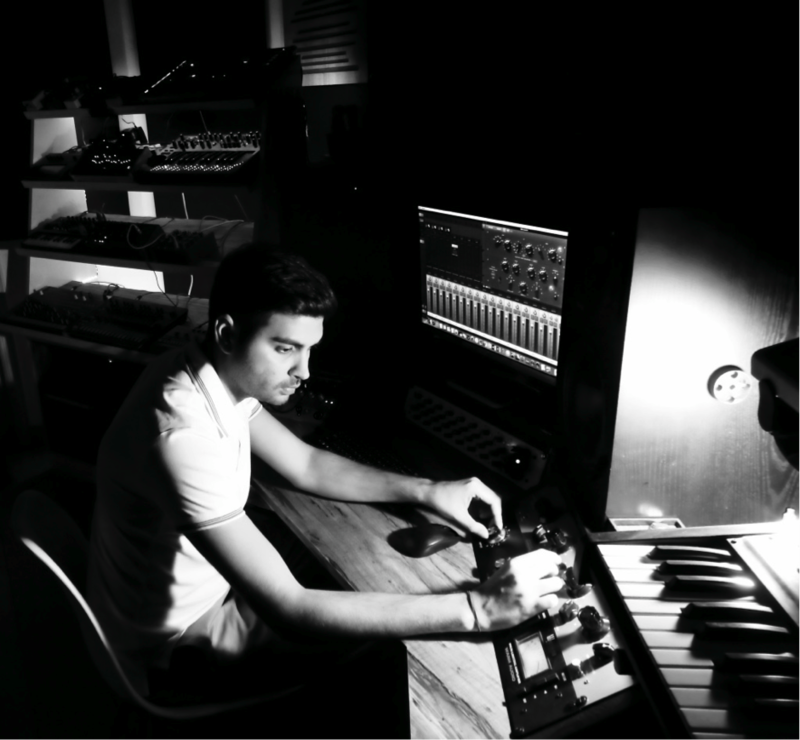 Track Science : Lukan on his ‘Bonobo – Break Apart’ bootleg incorporating analog abundance in his Lucknow studio. Lukan, the moniker of Nakul Mehan, is no less than an innovator from what can be best described as the first surge of House and Techno in India. Lukan’s act is unconventionally deeper than a mere display of sounds – it’s a musical translation of the differences in personalities and interests of Nakul and Lukan, who otherwise lead opposite lives. The story began eight years ago for Lukan; who has since keenly developed his signature sound through experimentation with different aural spectrums & analog equipment. Having worked closely with industry veterans in the U.K., Lukan has shared stages with the likes of dance titans Disclosure and electronic pioneers Eats Everything, Skream, Shadow Child, Ben Pearce and grime successor P Money. After studying abroad and living in different cities across the world, Lukan returned to his Indian roots and now resides in Lucknow – a city in the north of India. In a small town whose resources to electronic music are non-existent. As premiered by XLR8R, Indian DJ and Producer Lukan recently unveiled his Lo-Fi Bootleg of Bonobo’s ‘Break Apart’. Read below about how he put the track together. I layered 3 kicks to make the final kick. One of them came from my TR-8 while the other was a sample and the third was the sample crushed heavily through my WA-76 compressor which is a clone of the classic and sough after UREI 1176 compressor. On all my kicks I always use the UAD Helios plugin and usually just engage its circuitry at 60hz without any boosts. In the mixing stage I also always parallel crush the kick through a DBX 160, usually the UAD version but sometimes the Waves one too (for CPU Load reasons). The UAD SPL Transient Designer is also a must for me on all Kicks and Snares to shape the transients of the same. I layered my claps and also my hi-hats by passing them through a parallel signal into my RAT Distortion to give them some crispiness. Furthermore, I tame all my overheads using the STUDER A800 Plugin. The most time taking part for my Drum Design is always humanizing and creating the groove. This often involves creating volume envelopes, shifting around certain elements, side-chain compression with off beat ghost kicks and a few things that I just implement when I am in the production flow. The bassline was created using the Novation BassStation 2 as the main layer along with another layer which I synthesized using the Doepfer Dark Energy 2. The Doepfer has a very raw and heavy character to it as compared to what was created by the BS2 hence I used it sparingly. The frequency which was most appealing from the DE2 was carved out from the spectrum of the BS2 so the two could sit together. I then recorded the two into a single track and processed it through my Boss SD-1 to add some filth. Of course all this happened in mono since we are talking bass. I finally EQ’d the final bass bus using my WA Tube EQ which is a clone of the legendary Pultec EQ’s. Surely added some phatness down there. Of course I sidechained it to the Kick to make space and more importantly – make it pump. In the mixing stage, I parallel compressed the bass bus using a Fairchild 670 Emulation (UAD). I initially made an attempt to sample parts of the original Bonobo Track using the Maschine. However, I realised I was making a complete bootleg as opposed to my own production where I maybe wanted sample a few bits from existing tracks and make them unrecognisable. I dropped that Idea and just used Ableton’s Track View and started playing around by finding the best musical bits and also the best vocal bits. I then laid them into three broad bits – The Guitars, The Piano’s and the Vocals. They were then layered, bussed or grouped (whatever you want to call them) and finally treated like how I would have treated my own productions of guitars, pianos and vocals. However, since they were sampled they had to go through some extensive surgical EQ’ing to bring out the elements that I actually wanted to bring out. All vocals went through the Aphex Aural Exciter (Waves) and I even added a heavily parallel compressed version to them using the WA76 compressor. This was a mono version slapped against the brighter and wider stereo layer. I recently acquired about a 40 year old Roland RS09. The synth is very basic and produces only two types of sounds – Organs and Strings with limited parameters which can be adjusted. The strings and organs can be used in isolation or together in a layer. I’m not sure what combination I used but I haven’t heard better sounding strings coming out of any VST till now. The synth is just so warm and magical. I think there’s something wrong with it’s output jack or maybe it’s just a characteristic of the synth but there’s a little noise it adds which adds to the sparkle. Other chords and stringy layers were made using a combination of the Roland JP08 hardware and the Arturia Analog Lab plugin suite. I used the Virtual Piano from the suite to make, well, everything ‘piano’ in the track. The strings were kept mono and sat in the centre while the pianos were spread out using the Waves Spread plugin and also the Roland Dimension D emulation by UAD. I also used one of my MXR Delay pedals to add some automation to the piano during the build up of the track. I had to work unusually more on the fx processing of each element to get the Lo-Fi dubby sound I was after. I didn’t want a very clean and bright sounding sound and hence looked to the Moog MultiMode Filter (UAD) to filter out those highs and add a new dubby dimension to many elements. The kick bus was passed through the filter and at points even automated to give the kick some variations. The overheads and even the strings went through this treatment. On almost all other elements, the standard ableton auto filter was applied ever so slightly. It was however, automated to create a groove and feeling of suction and pressure. Over the past 9-10 years, I have finely created a mixing template that integrated my virtual and outboard gear. I produce and mix in a Hybrid format (combination of In the box and Out of the box). The template already has all the outboard and plugin inserts and send I usually use on those particular elements. I only have to tweak the settings a bit to get the sound I desire. Of course, sometimes I add new things and tricks when the sound doesn’t float my boat. All elements are finally bussed into a 16 channel combination of mono and stereo buses which are then passed through my Neve 5059 summing mixer which is the final gluing point of my mix-down. A stereo channel of the mix from the Neve is then brought back into my Daw through the Universal Audio Apollo 8 interface which is then sent into another Mix Stereo Track into my DAW which has a final chain of VST’s including the NEVE 33609 Compressor for some gluing, a 670 compressor to add some favour, a Manley Massive Passive EQ and and Oxford Limiter(not to limit it to a level of the final master but just to excite the mix).